Still smarting and licking their wounds from the historic thumping they took in the polls in the November elections, there is obviously no limit to how low these ideologues will stoop to attempt to invalidate or demonize their political adversaries, or as President Obama has called them, their “enemies.” Without even a hint of evidence or credibility, their immediate knee-jerk reaction in blaming Sarah Palin, Rush Limbaugh, or the Tea Party movement proves they have no shame, and need have no evidence, to blame their opponents in an attempt at self-validation after their ideology was rebuked and rejected last Fall. To the contrary, we learn that Loughner was, according to one of his classmates at Pima Community college, a “left wing wacko.” Another called him a “left-wing pothead.” And according to his YouTube profile, two of his favorite books are the Communist Manifesto by Karl Marx, and Mein Kampf, by Adolf Hitler. The most likely causes of his violence were his mental derangement and drug abuse, and likely had little to do with his political leanings. I couldn’t concur more that we need to “stop the hate! 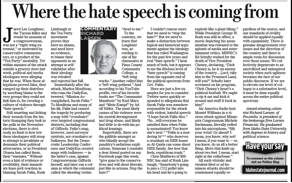 !” But we need to make a distinction between logical and historical arguments against the ideology that has ruled Washington for the past few years and real “hate speech.” I hear much of both, but it appears to me libelous level of “hate speech” is coming from the opposite end of the political spectrum from Governor Palin. All such vitriolic and virulent libel or ad hominem attacks should be condemned equally regardless of the source, and our standards of civility applied equally with equanimity. There is genuine disagreement over issues and the direction of the country and there is ample room for discussion over those issues. We collectively degenerate to an uncivilized and uninspired society when such ugliness becomes the face of our public discourse. If we are to elevate our level of colloquy to a substantive level, it must be done equally across the entire political spectrum.